Just finished a 60K sq ft property with 2 models. 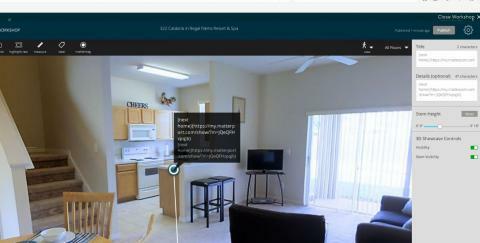 I saw a thread a long time ago linking 2 scans or 360 using a url and mattertags. I can't make it to work! If you can help, I appreciate it. I think it needs to be an a-ref in the mattertag content to tell it that it's a link. I'm on a train though so can't check for sure. Give it a try and hopefully it works. sounds very simple and I can't wait to do this. Thank you for your time responding. I appreciate you and thank you Lord Dan for this forum! Invelop, I'm mobile now, can you send me one that you did? Just did this one a week ago. When you're on the stairs of rear porch over looking the pool, you will see a tag in front of the Guest house biased towards the right. This links to the guest house and vice versa from Guest house scan to Main house. When the url does not contain "matterport" in it, I will open in a new tab / window. I don't think we can link to another place in the tour though. 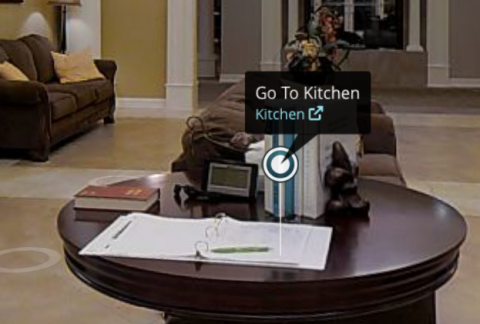 When I paste in a URL from my.matterport.com, it strips everything except the model ID. I could try a URL shortener, but it would then open a new tab... would love to link to another node. I don't think I'm doing this right. Want to see something FREAKISH? Hit U during a tour to find a direct link to any place in your tour. 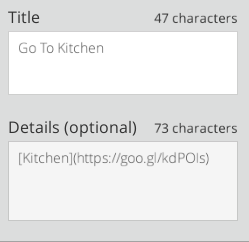 Make a MatterTag link to the 'Tag Navigation Link'. 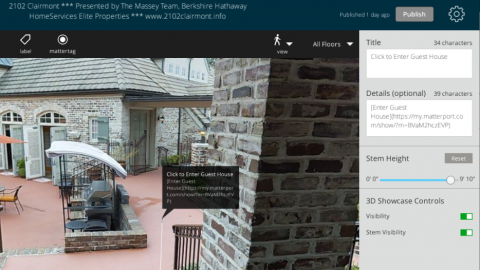 Clicking the Mattertag will swap to Mesh view and your tour will start walking to the location no matter where it is. Am i doing this right? 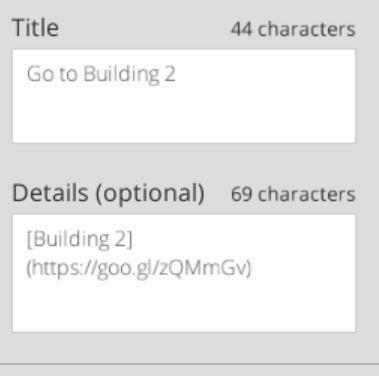 Invelop said: Open tags, insert name of link in brackets "[ ]" and then put the URL in parentheses "( )" click done and then publish. @metroplex. Dude you are waaay too smart for this forum. I almost got it. Thanks Invelop! I appreciate you. @Invelop - You're the one who is giving me ideas! I've never even tried this before! So while we're on the topic of being a clever clogs - this is the bit of code that parses URLs. The bit of logic here in in the code. If the URL has '#tn=' in it, then it's a link to a pano, so take the provided URL (all characters after the first 4). Otherwise ... if the URL contains 'matterport.com/show' then open up the tour that you've linked to with autoplay -- and it's handled differently if this is clicked on directly in a model or in a link iframe - which I guess is two different ways MatterTags could be rendered. Those are the only two options. I'm curious to see if I can stuff anything different next to #tn= and if it will work without launching a spooky guided tour. Wow Metro, I shld call you Albert Einstein! Now can you get a VT with 2 connected Models to work on a VR? There's not enough room in the Mattertag Description to link directly to a tour with specific positioning... kind of a bummer. If you have that pulled up and run a guided tour, you can watch the value change. For example, I noticed the first variable has something to do with the view you're in. The rest appears to be some sort of coordinates to position the camera in 3D space. It would be great if there was a way to change the walkthrough to the slideshow transition. I tried swapping options in workshop on the Highlight Reel to see if it affected the link but to no avail. @thebiggerpicture But then it'll launch a new tab -- not exactly what I'd want -- I just want to jump to another place in the same tour. Elevators vs climbing the stairs. That works for me since I have over 50K sq ft. I'm just wondering how a VR would work. I just tried to add a Mattertag link using the short code and it's not working. What did I do wrong?